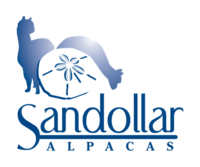 Collins Griffith, an extremely talented leather artisan who has been creating unusual saddles and leather accessories for more than 50 years, created this one-of-a kind product for our farm to take to alpaca shows! Now let him create one (or two) for your farm! 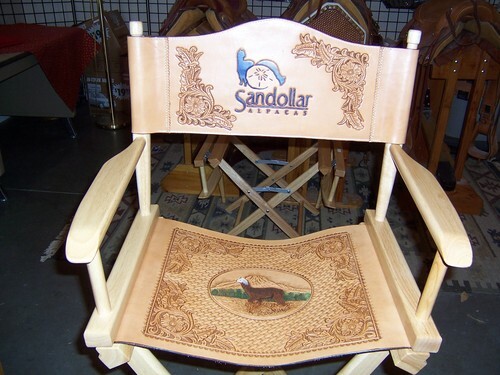 Your farm logo can be duplicated in leather on the leather back of the director's chair. And for a final touch, your name or initials on the reverse side of the chair back. For an additional charge, you can also send Collins your favorite photo and he can duplicate it as well on the seat! You will have a one-of-a-kind gift that will stand out from the crowd. The price quoted includes the logo on the inside chair back; as well as your initials on the reverse of the chair back. Call for a quote to obtain a quote for a chair including your favorite photo on the chair seat! Have something else in mind? Collins can probably do that as well; give him a call at on his cell at 509-378-5833 or call the office at 509-586-1423 to discuss your custom designed order.